Deep in the Ozark Mountains, Current River flows clear and cold. It meets Jacks Fork in angry crosscurrents that scour an untamed channel. Dangerous and unpredictable are its waters and banks--but never more so than in the summer of 1862. It is Civil War, and the Chilton family finds out exactly what gumption means. In the middle of the country, on the dividing edge of Northern and Southern sentiments, lines are drawn and the world they know explodes. ALEXANDER CHILTON has a Yankee sight trained on his head and hatred burns in his heart. The lone survivor of a Federal ambush, he joins Coleman's Regiment as a first lieutenant, but circumstances lead him to take the Confederate cause into his own hands. As a bushwhacker, he moves of his own accord and agenda. His once gallant reputation gains no favor when rumors of murder and thievery swirl. The war tightens. Brothers, cousins, and uncles continue to fall on their own land. Alexander stands in the torrent, torn between the blue eyes of ELIZABETH DAVIS and the rough gray of his personal rebel revenge. When orphaned at age thirteen, petite, raven-haired Elizabeth and her two younger siblings take refuge in the home of her AUNT BETSY and UNCLE JOSHUA CHILTON, a state legislator. There she becomes a skilled midwife and nurse. Across the river on the adjoining farm, she finds a kindred spirit in her fifth cousin Alexander. Local dances last for days, not hours, due to the remoteness of farms where her banjo, his guitar, and family fiddles set a fast pace. Alexander and Elizabeth find refuge from war in their music and in roles as family protectors. Protection weighs heavily on their shoulders due to a crushing military presence and guerillas without moral conscience that drive southward into the no-man's-land border region of south Missouri and north Arkansas. Federal Captain WILLIAM MONKS leads his men on sorties out of neighboring Texas County. Others raid out of Pilot Knob, Rolla, Waynesville, and Springfield. Rebels raid out of Arkansas. Cavalry on horseback with prisoners on foot becomes a euphemism for execution. After Confederate surrender, Alexander enrolls in the post-war Missouri State Militia of 1865, open to both former Rebels and Federals to quell murder and anarchy. His enrollment papers state "age 23, 6 ft. 1 in. tall, dark hair, gray eyes". In 1866, Alexander and Elizabeth's love affair storms above continued civil strife in the border region. The following year, the Governor forms a specific Missouri Militia unit lead by Captain Monks to rid Shannon and surrounding counties of bushwhackers: starve 'em out, burn 'em out, or shoot 'em. The couple escapes with their families from burning homes to the safety of anonymity, north to Little Dixie on the Missouri River. Printing companies' across the nation distribute celebratory Federal rosters--Alexander's revenge list. 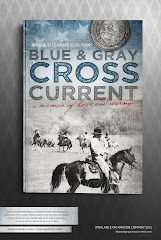 Blue and Gray Cross Current is the story of a vow that relentlessly propels Alexander and Elizabeth Chilton to the far edges of the continent. Stories of Civil War in the Ozarks - Schedule a Performance. Appropriate for Roundtable, Rotary, Historical Society, Schools, Living History, Heritage Days, Reenactment Ladies Tea. Goodreads History Group Civil War Books by title. Share book reviews and ratings with The History Book Club, and even join a book club on Goodreads.